"Everyone must fight!" No exceptions! Screen Gems has debuted a new international trailer for Burr Steers' Pride & Prejudice & Zombies, the classic-romance-mashed-with-zombie-horror adaptation due out next February. We've already featured two full-length trailers previously, and this keeps looking better and better the more they start to show. This trailer throws in just about everything - blood splattering everywhere, POV of the zombie-head-being-cut-off, the sisters teaming up in the hallway, it's all here and it looks pretty damn good. Lily James stars as Elizabeth Bennet, joined by Ellie Bamber, Bella Heathcote, Millie Brady, Suki Waterhouse, plus Sam Riley, Matt Smith, Jack Huston, Douglas Booth, and Lena Headey. You can still watch the first UK trailer for Pride & Prejudice & Zombies or the recent US trailer to compare. Jane Austen's classic tale of the tangled relationships between lovers from different social classes in 19th century England is faced with a new challenge -- an army of undead zombies. 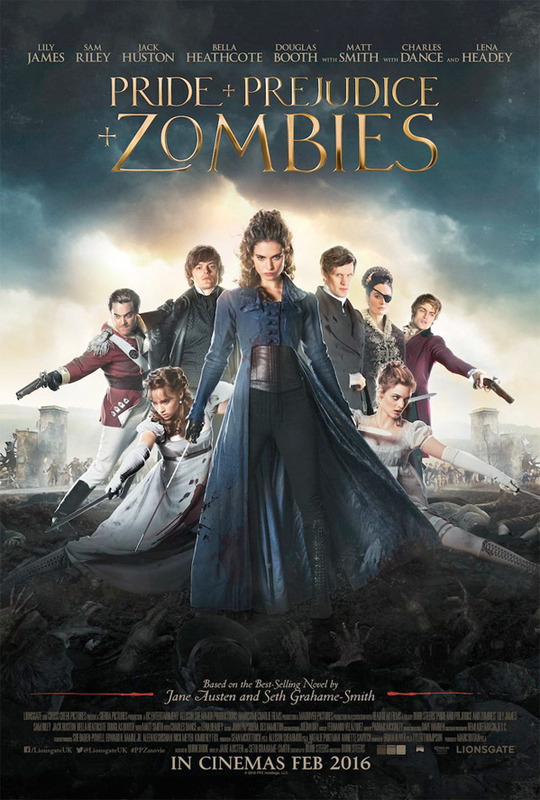 Pride and Prejudice and Zombies is directed by Burr Steers (Igby Goes Down, 17 Again, Charlie St. Cloud), from a screenplay also by Burr Steers. Adapted from Seth Grahame-Smith's novel, based on Jane Austen's classic story published in 1813. The film is produced by Natalie Portman, Marc Butan, Sean McKittrick, Brian Oliver, Annette Savitch, Allison Shearmur & Tyler Thompson. Featuring Lydia (Ellie Bamber), Jane (Bella Heathcote), Elizabeth (Lily James), Mary (Millie Brady), and Kitty (Suki Waterhouse). Screen Gems will release Pride and Prejudice and Zombies in theaters starting February 5th, 2016 next year. How does that look? Gone With The Wind & Zombies 12 Angry Men & Zombies The Good, The Bad And The Ugly & Zombies Lawrence Of Arabia & Zombies Singin' In The Rain & Zombies See what a bad idea this is...? The Hunger Games: Literally! Zombie Edition. Twilight! Damn it... I'm not very good at this. Yup, dropping a Zombie movie NOW is like going to surf when the seas have dried out. Who is the target audience for this movie? Dudes don't usually like period pieces and women don't usually like zombie gore, so.....do they think guys are going to overlook the baroque aspects because of what they can see for free on The Walking Dead? ....and speaking of, isn't everybody sick of zombies? Maybe it's just me. Yawn....this is gonna flop hard. Looks super lame.